In honour of Bastille Day, the French national holiday... 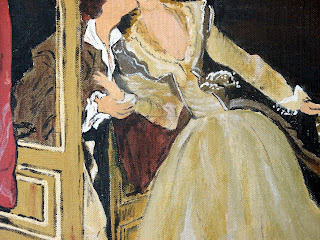 This is my study of Fragonard's "Stolen Kiss" 1788. Read more about Jean Honore Fragonard here . This painting is complete except for the facial details... 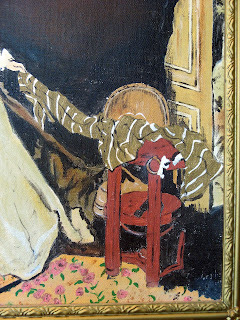 I have painted and removed the faces several times... the expressions have to be just right... so as of now... it hangs in the home of my mother... waiting to be finished... at least it is in an estate sale frame! 1 stick butter, cut in small pieces1 1/2 cups flour1/2 cup powdered sugar1 egg yolkIn a food processor, combine the flour and butter and pulse until you get a mixture that has the texture of cornmeal. Add the egg yolk and pulse until the mixture comes together in a ball. Wrap in plastic and refrigerate while you prepare the filling. Roll between sheets of plastic wrap and cut out circles larger than your tart shells, fit the dough into the molds and cut out the excess. Prick with a fork, cover with a sheet of parchment paper and fill with pie weights or dried beans. Bake at 350 for about 10-15 minutes. 8 plums (you might need more if you use the smaller Italian plums)1/4 cup sugar2 Tb finely chopped fresh rosemaryCut the plums in thin slices. In a non reactive bowl, combine the sugar and the rosemary and rub in between your fingertips to release the rosemary essence. Reserve one Tb of the sugar and set aside. Add the plums to the bowl and toss them in with the sugar. 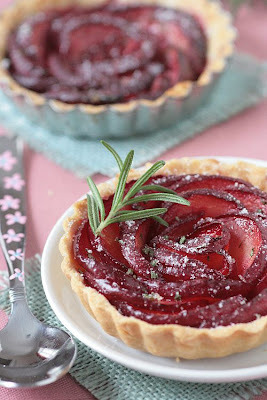 Arrange the plum slices on top of the cooled tart shells. Sprinkle with the sugar that had been set aside and bake for 20 minutes at 350F. Let cool and serve at room temperature. Happy Bastille Day or Le Jour Heureux de Bastille! Oh so beautiful picture! You are really clever! The tarte seems to be delicious...I'll try to make it! Thank you thank you for the silhouette! I love it!! I want to take her everywhere I go...! You were the bestest working on it with my variations. Fifi, from someone who can't even paint a shopping list, I stand in awe of your talent!! This work is fabulous - how insightful of you to wait for the right moment to finish the facial expressions, rather than rush in. Hello Fifi, what wonderful artwork! Your tart looks nummy :). Thank you for your kind comments, it was nice to have you drop by. I look forward to viewing more of your bloggie home, it's very beautiful. Your painting is amazing. I hope you show it again when it's finished. Today is my birthday, born on Bastille Day but sorry not French !!! 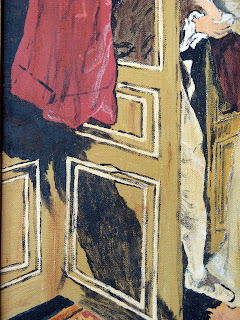 As usual, GIRGEOUS paintings. And wow, what a perfect frame! Plus, that tart looks delicious! Wow! This is marvelous. I actually kind of like it without the face details. It makes it interesting to imagine what is going on in their minds. I'm getting hungry at the sight of those tarlelettes! Your painting is amazing, I can't wait to see the finished result. Your work is beautiful! Happy Bastille day! Congratulations! You are officially in the SPOTLIGHT!!! Great work, Laura. Amazing copy. 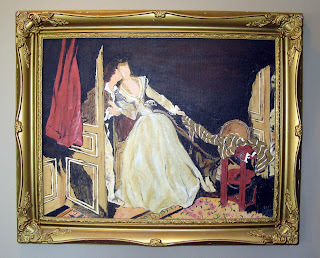 My mom used to have a Fragonard print hanging on the wall when I was little. Beautiful works of art and thank you for the tartlet recipe - rosemary sugar, yum! Le Jour Heureux de Bastille! Love your site. And now I want tarts, too. Hi Fifi, I'm so glad you enjoyed my minis! Your plum tartellets look like something I would like to make in mini and make to... EAT! :D Looks delicious!! Thanks so much for the comment, hope you'll keep passing by my blog, I'll surely be checking out yours frequently! Just a little reminder... this recipe is from the famous TARTELETTE... I have a link to her blog... please visit and see all her fabulous recipes! I want one of those tartlets! Yum! that painting of yours is marvelous!!!! it's one of my favorites! great job! Thank you for sharing the close-ups...they are lovely! I really like your painting better then the original. It looks fine as is actually. Love your work anyway. The Frame is excellent for it. :) Your Mother lucky to have it in her home. Happy Bastille Day to you too! Loving the painting! Wow.. I love the picture.. and your version of it is divine... it is just breath taking!